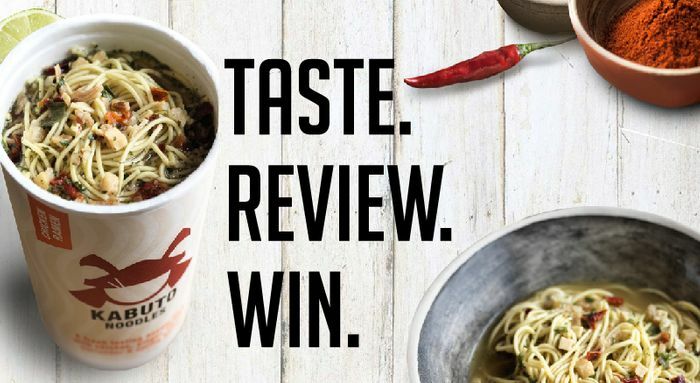 Fancy a free pot of Kabuto Noodles? All we need is a little help from you guys. Click the button below for more information. We need a little help from you guys! We hope you don’t mind us asking, but as we are such a small company (just 7 of us) we’d be super grateful if you wouldn’t mind logging onto your favourite supermarkets’ website and reviewing Kabuto Noodles as we’ve been told we could do with some more… and as a thanks we’ll send you some vouchers for FREE Kabuto Noodles to spend in-store! All you need to do to receive your free Kabuto vouchers is leave us a lovely review on your chosen supermarkets’ website and send a screenshot, your name and address to samuraichat@kabutonoodles.com. It’s that easy! A huge thank you in advance from The Kabuto Team! Forward this email to your friends and get them to sign up to the Noodle News and you'll be entered into a prize draw to win FREE Kabuto vouchers! Every forward of this email and new subscription counts as an entry, so get passing!